Hi Melissa!, It is always nice to write you! Thank you for a great question Marcelys. Being adequately hydrated during yoga is incredibly important. Your practice of yoga influences all of your internal organs, including your kidneys. As I mentioned in Namaste Yoga 241, Desikachar is quoted as saying, “Yoga is 99% waste removal,” and our kidneys are one of the organs through which we flush toxins from our body when we practice. Good hydration starts well before your yoga class. In other words, it is important to arrive on your yoga mat, well hydrated. Drinking a glass of water just before you arrive on your yoga mat doesn’t give your body time to absorb the water or properly hydrate your body. 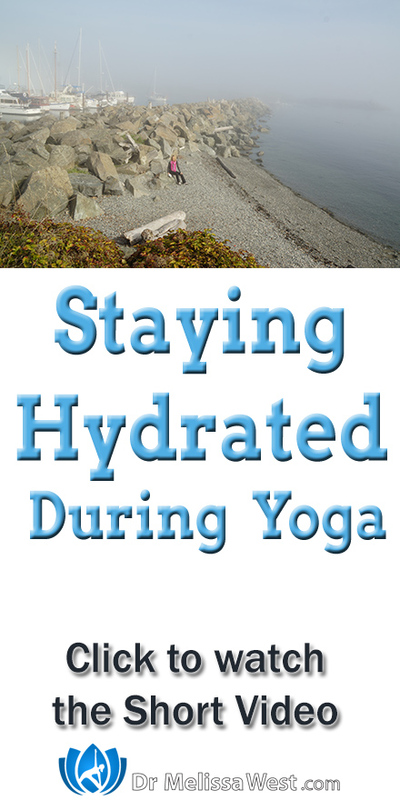 Good hydration starts as soon as your yoga class ends with replenishing your fluids. Good hydration starts the day before your practice. Good hydration starts as soon as you wake up in the morning. Start your day with a glass of warm lemon (or lime) water. According to Ayurvedic medicine lemon water will stimulate your gastrointestinal tract and peristalsis, the waves of muscle contractions that keep your digestion moving. Also, the lemons and limes are high in vitamins and minerals that will help move toxins from your digestive tract. Ayurvedic Medicine offers several tips for successful hydration. Sip your water throughout the day rather than chug your water all at once. When you chug it all it once, it runs right through you. Small sips allows your body to absorb and hydrate. You may notice on Namaste Yoga that I take small sips during the class. Drink your water warm or at room temperature. Cold water will douse your digestive fires which I realize is a completely different subject, but I know a lot of you don’t want to unintentionally slow down your metabolism. You may notice on Namaste Yoga that I often have warm herbal teas even rather than water in a thermos to sip throughout my teaching. Stay tuned for a Thirsty Thursday feature where I will share with you hydrating waters for your specific dosha: vatta, pitta and kapha.